Truly the best way to see Milford Sound is by helicopter. Soaring high above the cruise boats, you’ll fly the length of the stunning fiord all the way to the Tasman Sea. This 2.5-hour aerial adventure from Queenstown takes you into the heart of Fiordland National Park. 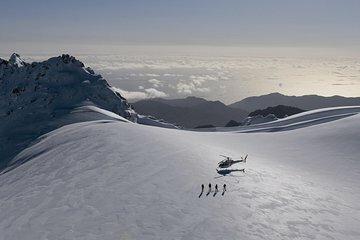 Your professional pilot hovers above iconic Mitre Peak and makes a landing on a coastal beach and atop Mt Tutoko glacier. Pick up included from all local Queenstown Accomodations. Departure times vary. We will respond to your request with available options. After pickup by coach from your hotel in Queenstown, board a modern Airbus squirrel helicopter and buckle into your seat for an exhilarating flight. Slip on a headset to hear the pilot’s commentary as you take off for Milford Sound. Prepare to be mesmerized by the wondrous landscape of Fiordland National Park. On arrival at Milford Sound, the helicopter shuts down for a short guided nature walk, including views of postcard-perfect Mitre Peak. Back on board, you’ll fly past sheer granite cliffs and lush waterfalls along the entire length of the fiord, landing on a beach at the Tasman Sea. The next portion of your 2.5-hour tour continues above snow-capped mountains and river valleys to blue-green ice falls. Come in for a landing on Mt Tutoko glacier, Fiordland’s highest peak, before returning to Queenstown and a courtesy shuttle to your hotel. Please note: Glacier landings are subject to weather and flight paths, and landings may change at the pilot’s discretion.